Last year's pregnancy go-to outfit of denim shorts and kimono is still a favourite combination this summer too. While in pregnancy I was appreciating slouchy tees for how well they accommodated a growing baby belly, I like them post baby too as they hide a little mum-tum. 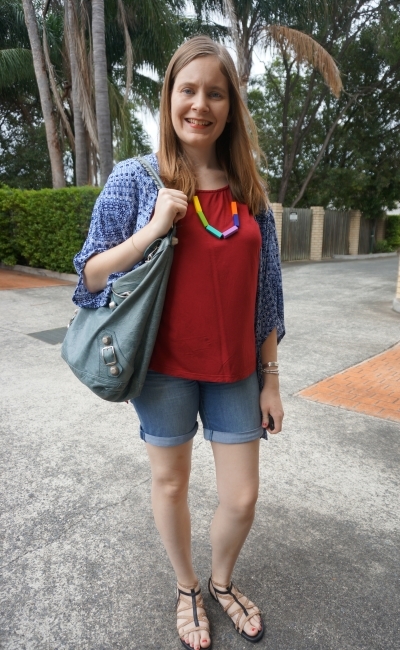 Simple shorts and tee outfit with some added colour and interest with the printed kimono for a busy morning. Viewing a possible plot of land for house building, Baby Boy's weekly weigh and an extra doctor's appointment for him. Phew! The outfit met a few style challenges on Instagram, as I'd planned it out in my head the night before. I thought the tee and colours in the print of the kimono would work nicely together, and the black shorts as I felt the outfit needed something neutral. I put it on, glanced in the mirror and thought it looked okay. When I looked at the photos later to put one up on Instagram I wasn't so sure. I'm pleased I gave the combination a try, and I don't think it looks that bad, it's just not as great as I'd imagined it would be in my head! Last worn: Ray-Ban Wayfarer, Somedays Lovin' kimono, purple tee, OneTeaspoon Hawks shorts, studded sandals, Balenciaga tempete day bag. Other ways to wear: Somedays Lovin' kimono and jeans, purple tee and winter layers, OneTeaspoon Hawks shorts in spring, studded sandals and printed skirt, Balenciaga tempete day bag and pink blazer. Another shorts and tee outfit topped off with a kimono. Red isn't a colour I wear often (although I love my red handbags), but I enjoy wearing it when I do. I wanted to add something to this outfit so the printed kimono was perfect. I like blue and red together. The colour combo achieved a few style challenges for the day on Instagram too. Nice and comfortable for a trip to the library for rhyme time with the boys. Unlike the outfit above, the kimono was a last minute addition to this outfit that I hadn't planned in advance. I actually liked this outfit more though! What do you think? 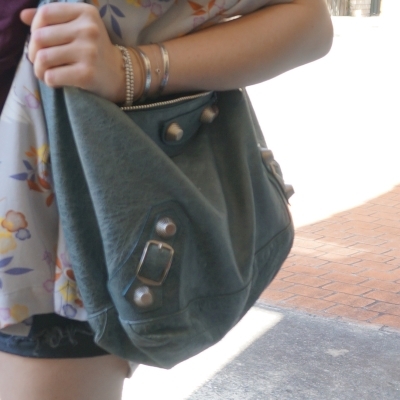 Last worn: navy printed kimono, red tee, bermuda denim shorts, studded sandals (above), Balenciaga tempete day bag (above). Other ways to wear: navy printed kimono and skinny jeans, red tee in winter, bermuda denim shorts and green tank, studded sandals and shirt dress, Balenciaga tempete day bag and maxi skirt. Linking up with On Trend, Turning Heads, Style Sessions, Wardrobe Wednesday, What I Wore. I quite like the first look. I think that top and printed kimono work well together! Also the print on that blue kimono is just lovely. I prefer the second outfit as well, but then again red is my favorite color. I think I like the second outfit a bit more too...but the first one is also lovely. It is just that I think this red top really suits you well. You should wear more red. Great outfits, both of them. Shorts plus a top is a good choice for Summers. It will be a while before I can try it:) but I will surely wear it this Summer too. I love both necklaces btw. You wear statement necklaces so well. I think such necklaces are a lovely way to personalize our outfits! Happy new week! All super cute looks and thanks for the inspiration always especially with styling kimono tops! Have a beautiful week ahead! Can't beat a slouchy tee I don't think! I love that first kimono! Super cute. Happy Monday! I love your kimono collection but I actually think I prefer the first one (though both looks are great). The pattern on it is gorgeous! This has happened to me quite a lot too. I love the idea of an outfit in my head, when it's on, but when I see it in photos, I have a change of heart. I've also found that my outfits that are not planned, rather last minute, are the ones I love both on and in photos, so weird. I guess I don't give myself too much time to contemplate and plan things through that makes it all work. That said, I like both outfits, especially the last one, the red looks good on you. Thanks for sharing and have a great week! Looking at a plot of land for house building?! How exciting!! I really like the patterns of both kimonos. Maybe I'll branch out and try a kimono once the weather warms up! Thanks Jess! it's slow going, but we are still trying to find our perfect home! I'm drawn to the second look as red looks so good on you Mica ! And oh wow what a feat to find a lot to then build ! Good luck. Thanks Lorena. Not easy to find land where we want to live either! Mum Yum, love that! And love your comfy tee. I love the first look cos of course its purple. Cute elephant necklace. I really like both looks! I'm jealous that you can go out with shorts on while I have to bundle up. :( I hate the cold. Love both of these relaxed summer looks! The colored tees, bag, and kimono really add interest! I love a kimonos and slouchy tee. And that bag is beautiful! Both outfits are great! Yes, this outfit is also perfect if one is not pregnat! Personally I'm a huge love of denim shorts and together with the kimonos you created perfect combinations! Both looks are fun, and I love the red on you!! I like the first look too, although I hate it when I love something in my head but not as much in real life :) Hope baby boy is doing okay and you got some good news from the doctor! Thanks Shea! :) Poor little guy has so many appointments! Loving these looks, babe- I'm such a sucker for Balenciaga! I can see why this combination would be a go to look for you since it's stylish and put together without being fussy. Hope you're enjoying a lovely week! I love your light kimono layers to dress up your tees and shorts, and I think the red and blue combo works really well. Cute teething necklaces! Especially the elephant one! Don’t you just hate it when that happens? Though, I do think the outfit looks nice! I love that looks! It's probably my on to go looks I use th most during summer (even though I don't need to hide tummy). I wish I would wear the alike set now. Before I even read the first sentence, I was going to say how much you always put together shorts+kimonos. You wore these for some busy mum days with the kids, phew! Love the kid-friendly necklace, great color pops! You look great in these denim shorts! I have a pair that I love wearing in the summer. 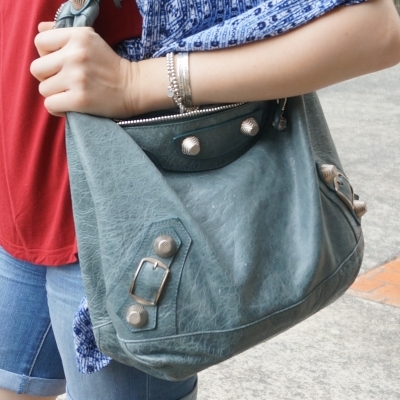 Great steel blue color of your bag and darling necklace Mica! thanks for linking with turning heads tueaday! Its a really nice combination Mica! I love your kimono selection. I didn't know your husband was Asian. Now it all makes sense. Excuse me while I copy your maternity style. (; I always loved that first kimono. Something about the colors is just super calming! I can't wait until it's warmer here and I can start wearing all my kimonos! Thank you all for your kind comments and opinions on the outfit feeling not quite right.